Select Edit > Create node and choose from the list of node categories a new to add node to the Graph. Right-click in the Graph and select this entry in the contextual menu. See also the Nodes reference guide for details on the node categories. Press the keyboard shortcut Ctrl+G to create a group from the selected nodes. See Grouping nodes for more details. Click on a node and select Edit > Disable node. When a node is disabled, it has no effect on the nodes to which it is connected. Disable/enable a node by clicking its button or pressing the keyboard shortcut D. See Disabling nodes for more details. Click on a node and select Edit > Rename node. Edit the node name in the pop-up dialog. Press the keyboard shortcut F2 or right-click in the Graph and select this entry in the contextual menu. See Modifying a node name and adding comments for more details. Click on a node and select Edit > Add comment. Add the comment in the pop-up dialog. Right-click in the Graph and select this entry in the contextual menu. See Modifying a node name and adding comments for more details. Click on a node and select Edit > Replace with and select either Compatible node or Any node. Right-click in the Graph and select this entry in the contextual menu. See Replacing nodes for more details. Click on a component in the Models window and select Edit > Change component properties. This entry is only available if a component or components are selected in the Models window. See Modifying a component name and adding comments for more details. 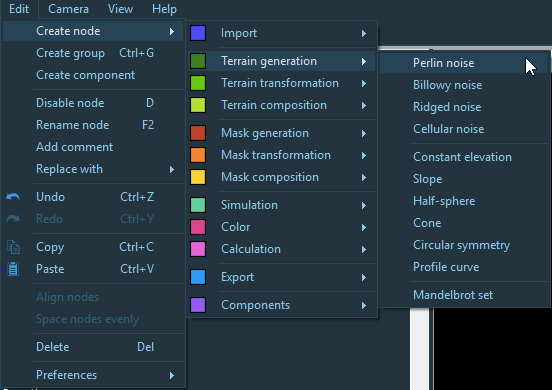 Click on a componet in the Models window and select Edit > Delete component. Select Edit > Undo or Redo or press the keyboard shortcuts Ctrl+Z and Ctrl+Y, respectively, to undo or redo the last action. If there is no action to undo, this entry is grayed out. Select Edit > Copy or Paste or press the keyboard shortcuts Ctrl+C and Ctrl+P, respectively, to copy the selected node(s) to the Clipboard or paste it at the mouse cursor position. If no node is selected, this entry is grayed out. Select at least two nodes that are not already aligned. Select Edit > Align nodes. Select at least three nodes that are not already spaced evenly and select Edit > Space nodes evenly. Right-click in the Graph and select these entries in the contextual menu. See Aligning nodes for more details. If the nodes are already evenly spaced, the entries does not appear in the contextual menu. Select Edit > Delete or press the keyboard shortcut Del to delete the selected node(s). Select Edit > Preferences > Backup settings... to open the automatic backup settings dialog. See Automatic backup for details. See Setting the lighting for more details.